If you have traveled with electric unicycles, please share your experience! Still very useful for airline travel that it states so clearly that it's 160wh. Does anyone have any up to date info on Wheels being allowed on flights? Im looking to fly from London to Vienna and would love to take my X8. Can you take it as hand luggage or does it have to go in the hold? If the united states it's been getting much more strict because of the hoverboards bursting into fames. I don't know about Europe, although I know that London was getting very strict with the hoverboards as well so I'm not sure if that has spilled into EUC like it has in the united states. According to the International Air Transport Association (IATA), a recent release has been written the 19th February 2016 for small vehicules powered by lithium batteries. The following operators (airlines) have implemented a total prohibition on the carriage of balance wheels, hoverboards and other self-balancing vehicules in passenger baggage. I took my Solowheel Xtreme from Seattle to Atlanta to Key West, and back...and TSA surprisingly was totally uninterested in the unit. I didn't get a single question from them, but I did from everyone around me. However, what were you prepared to do if they did object? Miss your flight? That's the problem - you might not have a problem but the next person will depending on what side of the bed the TSA agent fell out of. Marty, I had a friend wait outside security in Seattle as I went through and TSA didn't even look at my wheel. I put it on the belt, and it was a non-event to them. So I felt fairly comfortable knowing that things would be fine. I did have a copy of TSA's policy on battery wattage, as well as Solowheel's website printout of specs just in case I needed to defend my wheel, but it was not necessary. I then took my wheel through airports in Atlanta, Key West, and Eugene and had the same experience. 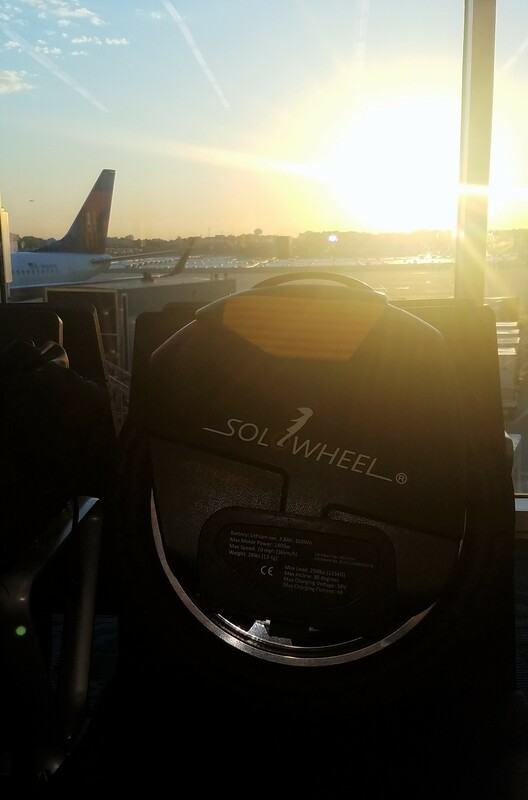 The ONLY time an airport or airline employee said anything to me after taking both my Airwheel X8 and my Solowheel Xtreme on planes was when boarding my flight last month from Atlanta to Seattle. The plane was totally full and i was one of the last people to board. They were gate checking bags because overhead bins were full and the agent tagged my wheel to be checked and left at the bottom of the ramp with the other bags to be loaded into the cargohold. I inquired if it would come out as oversized baggage or down the main carousel since I didn't want it being thrown down a conveyor belt like some of the bags you see, and she said to check the oversized. A couple minutes later a different agent comes to find me as I'm leaving my wheel per instructions and tells me the flight crew will help me find space just to make sure nothing happens to my Xtreme. So I boarded the plan and asked one of the crew and they happily helped me find space. That was an Alaska Airlines flight booked on Delta.